We present here an individual income percentile by age calculator for the United States for 2018. Enter an age and pre-tax income earned in full-year 2017 to compare to income percentile by age. You can also choose to compare the income curve from other ages using the pulldown menu. Need a different tool? See our individual income calculator and household income calculator. Also see our net worth calculator and net worth by age calculator. What was the Average Income by Age? How About the Median Income by Age? 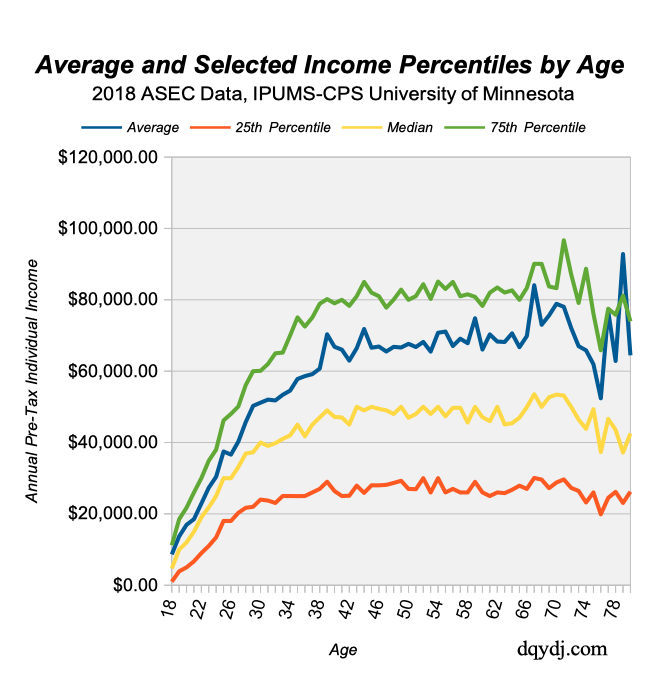 The following table lists the average income by age along with the median, 25th percentile, 75th percentile, and the top one-percent (99th percentile) income. See the note on data quality in the methodology section. Note that while the top one-percent is usually referring to an income… net worth is better, so try our net worth by age calculator after. 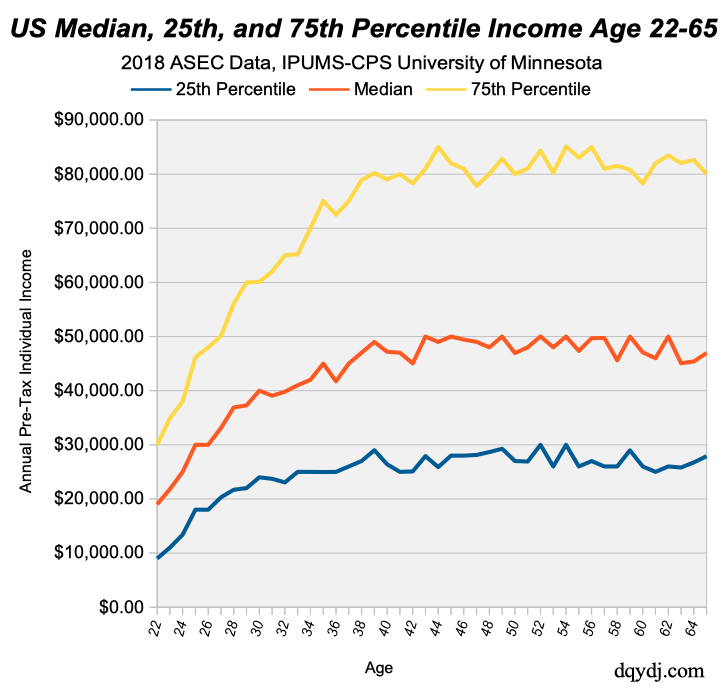 The following graph shows the median income by age and the average income by age for ages 18 – 80 in full-year 2018 in the United States. Although you’re looking at a static snapshot of current earnings across a large selection of Americans, it’s always interesting to see the trend graphed. Somewhere in the late 30s to early 40s earnings across an array of different ages level out. For example, a median 40 year old earner is very similar to the median 60 year old income earner. It’s only for folks early in careers or still working past the average retirement age that we see earnings volatility for different percentiles. While this data is from a single year and a static snapshot, you can make some interesting assumptions about income over a career. For typical earners in the middle 50% of the earnings curve, earnings likely top out somewhere around the late 30s to early 40s. Although that statement comes with a ton of assumptions and caveats due to the lack of longitudinal data, it’s got plenty of support. What can we theorize about income by age from the graph? There’s no direct way to measure experience in this data, but age is a reasonable proxy. Most folks ~15-25 years into a career are probably near the top of their prowess relative to others. The aforementioned 40 year old worker probably knows roughly the same as most 50-60 year old workers – and by then the top, median, and poor performers in an industry are likely roughly set. Why might that earnings theory be wrong? In probably “approaching 0%” of cases, no worker is ever exactly tied to a single percentile by age over a career. Due to windfalls such as home and business sales along with raise timing, stock, and other factors – people’s relative rank is changing all the time. And that’s a good thing! Income mobility, or the chance to change one’s relative earnings power over time, is a hallmark of the as-defined American Dream. But even then, the income earned by age stops changing relatively around 40-42 years old for the middle income percentiles. We’d love to see your take in the comments. For methodology we match the 2018 individual income bracket post. Age is as of March 2018. Total income comes from a variety of sources, see them all here. Data quality varies by age, and you’re also looking at some survivorship bias in the workforce for older folks. For ages 18-64 there are at least 1,000 responses per age. Age 80 actually spans age 80-84, and there are 289 samples. Age 79 has fewer than 100 data points(!) and there is a rough linear increase of data points from 79 up to 911 at age 65. Please treat the data accordingly; we’d bet against $1,000,000+ being the actual 1% income for age 77 and 79. Want to see changes for an age over time? Try our income percentile by age calculators from years past! How did your income stack up to your peers in 2018? Did you increase your rank or did it increase since 2017?